hIstory:Wherever you travel in North Cyprus, the history comes alive; For nine thousand years, Cyprus has been a melting pot of great civilisations; from the Neolithic settlements on the northern coast to the Egyptian, Persian, Roman, Venetian, Ottoman and British Empires. It's strategic location at the cross-roads of East and West has bestowed on the island with a rich and colourful history spanning for centuries. During the course of its vibrant past, the island has been visited by the Romans, Alexander the Great and Richard the Lion Heart, to name a few, each leaving its own unique footprint. For a good sense of how it all began, the island’s museums are well worth a visit for their fascinating array of artifacts discovered in cave dwellings dating from 7000BC, when the first inhabitants of Cyprus are said to have settled. From 3000-700 BC, Cyprus began to emerge as a trading centre, with copper mines drawing merchants from all across the Mediterranean. Attracted to the growing opportunities, settlers arrived from Anatolia and Phoenicians from Syria, bringing new Levantine architecture, ceramics and metal working to the island. In the 6th Century BC, the Persians adopted Cyprus as a base for their wars with Greece until 333 BC, when Alexander the Great brought the Persian Empire to a sudden end. This was followed by rule of the Ptolemies of Egypt which lasted for 250 years until 48 BC, when Rome was able to annex the island. But it was merely a few years later that Julius Caesar gave the island back to his lover, Cleopatra, the last of the Ptolemies, and only upon her death was Emperor Augustus finally able to add Cyprus to the lands of the Roman Empire. Between the 1st and 10th Centuries, multiple communities continued to emerge on the island, with Muslim and Byzantine settlers coexisting in relative harmony. However, all this came to a halt in 965 AD, when the Byzantines took full control of the island upon defeating the Muslim Caliphate’s Egyptian fleet. Byzantine rule lasted until the 12th Century, upon which King Richard the Lion-Heart prevailed, handing the island to Guy de Lusignan, a member of French Medieval Royalty, to finance his expeditions. 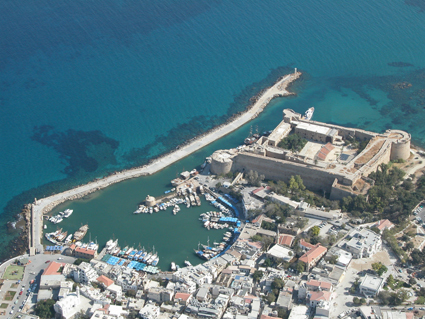 The Lusignans, inhabited the island for 300 years, from the 12th Century until 1489, when the Venetians captured the island with the impressive Girne Castle, as well as the celebrated architecture of Gazimağusa (Famagusta) and Lefkoşa (Nicosia), which are all well worth a visit. The Ottoman period in Cyprus began in 1571 and lasted for more than three centuries, during which time the two Cypriot communities, Turkish and Greek, began to emerge. It was during this time that the British were granted the right to govern Cyprus for the Sultan in an agreement dating back to 1869 which lasted until the end of the First World War. In 1960 the Treaty of London and Zurich were signed to give independence to Cyprus as a partnership state between the Turkish and Greek Communities of the island. The guarantors of the new state were Britain, Greece, and Turkey. However, in 1963 relations between the two communities separated by language, culture and religion, had deteriorated and civil war began. The United Nations sent in troops in an attempt to restore peace, creating the Green Line, which effectively divided the two communities. In 1974 Greece attempted a military coup in conjunction with the Greek Cypriot National Guard in a bid to achieve ENOSIS (Idea of union with Greece), thus Turkey, after consultation with Britain, intervened militarily to protect the Turkish Cypriot community, in exercise of the guarantor powers. Since these events, the island has remained divided, and in 1974 North Cyprus began its journey towards independence, with today’s Turkish Republic of North Cyprus (TRNC) being formally established in 1983. It is a fully democratic state and internal peace subsists. On 23 April 2003, the borders between the North and South were opened and it is now also very easy to get around the whole island, making North Cyprus a truly excellent destination for those who dream of a holiday steeped in history. As you explore the island, you will enjoy the enduring echoes of its multicultural heritage. geography: Located at the cross-roads of three continents, Cyprus is the third largest island in the Mediterranean, situated 40 miles south of Turkey at its nearest coastal point. It is smaller than Sicily and Sardinia and larger than Corsica and Crete. 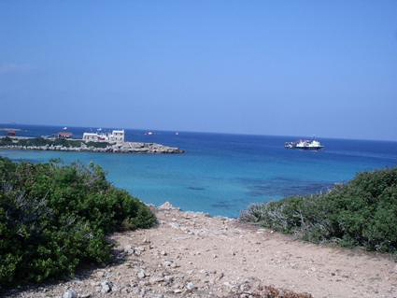 North Cyprus comprises a total area of 1357 square miles, with over half of the Island’s 240 miles of coastline. Cyprus has been divided into two autonomous states since 1974. This came about by virtue of the linguistic and cultural differences, and as a result of communal friction which lasted for 11 years (See history). Greek Cypriots occupy the southern and the Turkish Cypriots occupy the northern part of Cyprus. A boundary known as the `Green Line` runs through Lefkoşa (Nicosia), the capital of both South and North Cyprus, separating the two states. The geography of North Cyprus is characterized by a unique blend of beaches, plains and mountains. The Kyrenia or Beşparmak (Five Finger) mountain range, with its magnificent jagged limestone peaks, the highest of which is Mount Selvili at 3357 ft., runs along most of the north coastline to form a startling backdrop. To the east of the island the mountain range loses height as it extends along the narrow peninsula known as Karpaz or “Panhandle”, a spectacular region of rolling hills and unspoilt sandy bays. To the south of the Five Finger range lie the plains of Mesaoria and the capital city Lefkoşa. Other major centres are Güzelyurt in the west, the resort town of Girne (Kyrenia) on the northern coast, and the second resort town of Gazimağusa in the east. clImate: North Cyprus enjoys a very pleasant climate, with warm, dry summers and mild winters, and an average of 300 days of sunshine. In August, the hottest month, mean temperatures range from 21°C to 36°C and in the coldest months of January and February, the average temperature is around 10°C, with a winter average of 6 hours daily sunshine and only moderate rain, making it an ideal year-round destination. wIldlIfe: North Cyprus is still relatively undiscovered so wildlife flourishes, with some 250 species of birds touching down on the island every year on the passage from East to West. There is also an abundance of lizards, wild donkeys and butterflies, including species which are unique to the region, such as the strangely-shaped festoon and Cleopatra butterflies adorned with the colours of sunshine. They are all part of a rich natural heritage on an island of contrasts that spans from the top of Mount Selvili’s 3000 feet to the gentle slopes of the coastal waters, where the famous loggerhead turtles come ashore to lay their eggs. The warm climate in North Cyprus also means visitors can enjoy beautiful flowers all year-round, making it a veritable botanic haven. In the autumn and winter golden-yellow oleanders swathe the hills, whilst multi-coloured anemones and crocuses appear before Christmas. But it is in late winter and spring that the island blooms into a rhapsody of colour with the orchid family and cherry-red poppies taking centre stage. The majority of the Turkish Cypriots are Muslim and although very few regularly attend mosque services or wear religious attire, most celebrate religious festivals. For Turkish Cypriots, family life is of ultimate importance and therefore a great amount of their free time is spent at family gatherings, barbeques and weddings. All towns and even some villages hold festivals many of which are in the early summer (see events). The culture of a place is always reflected in its kitchen, and Northern Cyprus is no exception. Cypriot cooking, like its people, is unique. Eating out is popular amongst locals and the choice of cuisine reflects this, combining many wonderful tastes from the Mediterranean, Turkey and the Middle East. In larger towns, a range of international restaurants also offer dishes from around the world. Typical Turkish Cypriot restaurant meal consists of meze, kebabs (lamb or chicken) or fish, followed by fruit and coffee. Meze is a selection of hot and cold appetizers - the Turkish Cypriot equivalent of Tapas – such as kofte (meatballs), hummus dips, mint yogurt, hellim (goat’s milk cheese). A Turkish Cypriot speciality is the şeftali kebab (peach kebab), made with minced meat, chopped onion and spices, wrapped in lamb fat and grilled. Other mouth-watering dishes include marinated fish and squid - and for dessert, lokma (small doughnuts in syrup), Ekmek Kadayif with Cream (Turkish Cypriot bread pudding) or baklava, as well as freshly-picked fruit such as sweet melon, oranges and figs. Wash your meal down with a glass of rakı (alcoholic aniseed drink), or there are also many good wines, beers and spirits, including the famous brandy sour drink – a cocktail made with brandy, lemon juice and angostura bitters. If you have room, you may want to finish off with a fix of thick Turkish coffee or tea. Cypriot home cooking is quite unique and is only found in a handful of restaurants in North Cyprus, so do look out for them. Food lovers will delight at the variety of fresh local produce. Fresh herbs such as wild thyme, calamint, fennel, oregano and sage flourish in the mountains, ready for picking in June. Traditional cuisine makes fine use of the abundant fresh fruit, vegetables, herbs and spices – this includes a variety of vegetarian dishes such as yalancı dolma (stuffed vine leaves with rice, onions and tomatoes), stuffed peppers and tomatoes, melt in the mouth aubergine meals, sigara börek (fried white-cheese rolled in pastry), bulgur koftesi (cracked wheat balls) and home made baked beans. Lefkara embroidery is an old Cypriot tradition dating back to the Venetian period, where beautiful and intricate items such as bed covers, table cloths, doilies and head-scarves were weaved using drawn and counted thread embroidery on lace. It is said that on a visit to Cyprus, Leonardo da Vinci was so impressed by the Lefkara adaptation of Venetian embroidery that he took some of the embroidery bearing the “potamos” design back to Italy to drape on the altar in the Milan Cathedral. Today, this design is known as the “Leonardo da Vinci design”. Carpet weaving is another age-old Cypriot tradition and is mostly found in the Gazimağusa region. Kilims (small floor rugs) with colourful designs and patterns make ideal souvenirs or gifts, whilst wicker basket weaving is another Cypriot art form that is popular with locals and tourists.